Pumking is an ode to Puca, a creature of Celtic folklore, who is both feared and respected by those who believe in it. Puca is said to waylay travelers throughout the night, tossing them on its back, and providing them the ride of their lives, from which they return forever changed. Brewed in the spirit of All Hallows Eve, a time of the year when spirits can make contact with the physical world and when magic is most potent. Pour Pumking into a goblet and allow it's alluring spirit to overflow. As spicy aromas present themselves, let it's deep copper color entrance you as your journey into this mystical brew has just begun. 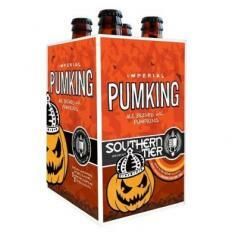 As the first drops touch your tongue a magical spell will bewitch your taste buds making it difficult to escape the Pumking.